Figure 1. Galena from the Krushev Dol mine, Madan ore field, Rhodope Mountains, Smolyan oblast, southern Bulgaria. Sample 67x66x29 mm. Note the twinned and truncated crystals of coarse galena with rounded margins to the crystal faces. The lead sulphide is associated with a fine-grained black sphalerite. This sample is from Minerals Bulgaria in Ilford, England. 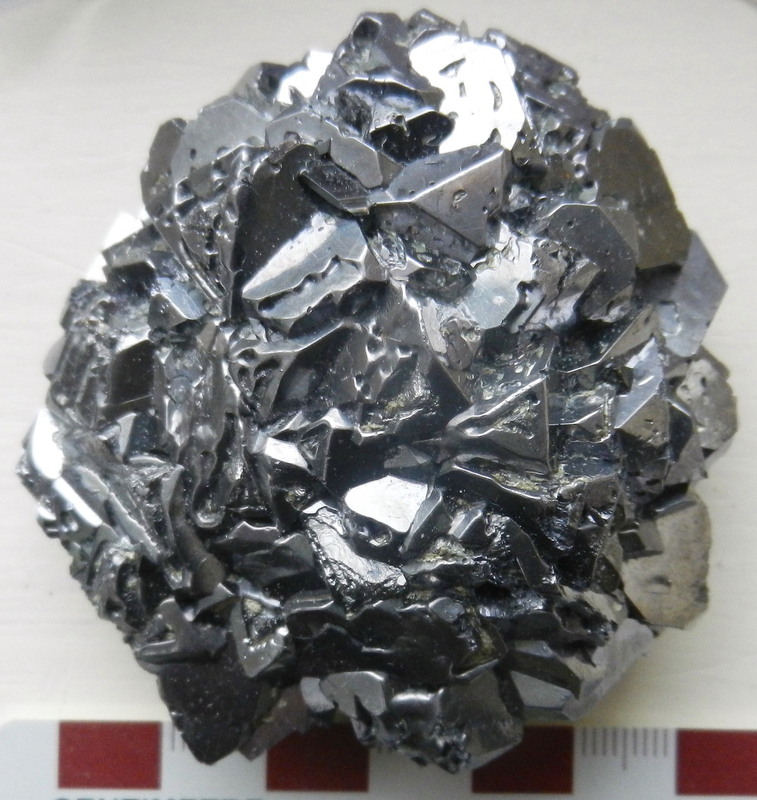 soft, dull grey, heavy and distinctive, galena has been known since antiquity. A simple sulphide, ideal chemical formula PbS, its cubic crystals are well-known and distinctive, in both hand sample and polished specimen. Some cubic crystal habits (forms) are listed in Table 1. There are currently five other "rocks" in the Rock of the Month index, that have galena as a principal or sole ore mineral. Two come from the Madan ore field in southern Bulgaria, and the Viburnum Trend of southeastern Missouri, and are sufficiently coarse-grained to be worth another look in the context of crystal habit. Figure 2. Coarse galena (with less-obvious sphalerite) from the Huanzala mine, Huallanca, Ancash department, Peru. Sample is from David K. Joyce. Large-scale mining aside, Peru is a fertile source of fine mineral specimens (Crowley et al., 1997). The Huallanca district contains the Huanzala, Mercedes and Chiurucu mines. 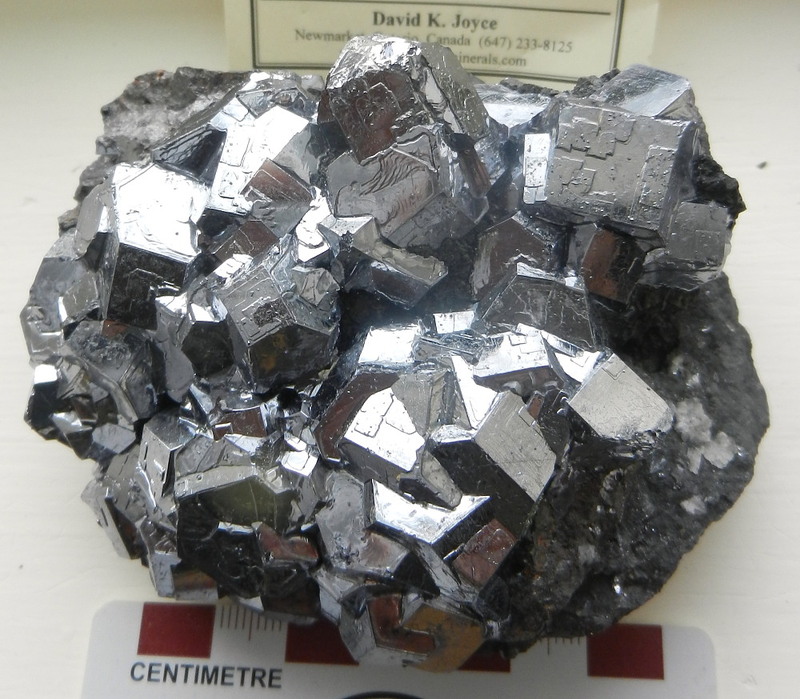 Galena (with silver values) is a key ore mineral, and appears in fine specimens (e.g., Moore, 2005). Huanzala is noted for fine mineral specimens of other minerals besides galena. Examples include sphalerite and its rarer ZnS polymorph (wurtzite: Hyrsl and Rosales, 2003), pyrite (Gait, 1978), pink and purple fluorite, fluorapatite and rhodonite. Pyrite pseudomorphs after pyrrhotite are known (Hyrsl, 2008). Huanzala is also the type locality for huanzalaite, a member of the wolframite group, which occurs as inclusions in scheelite (Miyawaki et al., 2010). Huanzala is not alone in mineral-rich Peru, but is one of numerous polymetallic epithermal systems, along with Cerro de Pasco, Colquijirca, Hualgayoc, Julcani, Morococha, San Cristobal, Quiruvilca, Pasto Bueno and Huaron. Discussion of the mineral assemblages and paragenesis include those by Bodenlos and Ericksen (1955), Bartos (1989) and Baumgartner et al. (2008). A mineral species is defined as a naturally-occurring substance that has a definite crystal structure and a composition that is either fixed or varies within known limits. Minerals are mostly abiogenic, though organisms living and dead, of all sizes, may play a part in their development by providing chemical elements and/or favourable sites for their nucleation and growth. These pages tend to focus more on a mineral's composition than its structure, but the arrangement of atoms in a mineral is fundamental to many aspects of each mineral, including physical and optical properties. Determination of crystal structure, most often by x-ray methods, is a key method by which mineralogists and crystallographers identify and characterize a mineral species. The two examples of galena shown on this page display pitting (Fig. 1) and/or embossed tables atop major faces (Fig. 2) which may relate to their growth and deposition from hydrothermal fluids. Either the galena or inclusions and embayments therein may grow or be resorbed as the temperature, pressure and composition of the fluid evolve with time. The crystal habit of a mineral refers essentially to to the development of certain crystal faces in preference to others. This determines the shape and general appearance of a mineral in a given specimen. Galena is a textbook member of the cubic crystal system, the simplest of structures,in which each crystal ideally displays three axes that are mutually perpendicular and of equal length. The classic shape or habit is of course a cube, as seen in the Viburnum sample on these pages. Another is the octahedron, and a third the dodecahedron. Galena, halite (common salt), fluorite and diamond are all species of mineral that display variations of cubic crystal development. The members of the garnet family of silicates are also cubic. However, some minerals display certain habits more often than others: galena, halite and fluorite often develop as perfect cubes, but many variants are possible. Bartos,PJ (1989) Prograde and retrograde base metal lode deposits and their relationship to underlying porphyry copper deposits. Econ.Geol. 84, 1671-1683. Baumgartner,R, Fontbote,L and Vennemann,T (2008) Mineral zoning and geochemistry of epithermal polymetallic Zn-Pb-Ag-Cu-Bi mineralization at Cerro de Pasco, Peru. Econ.Geol. 103, 493-537. Bodenlos,AJ and Ericksen,GE (1955) Lead-zinc deposits of Cordillera Blanca and northern Cordillera Huayhuash, Peru. USGS Bull. 1017, 166pp. plus 12 separate sheets. Crowley,JA, Currier,RH and Szenics,T (1997) Mines and minerals of Peru. Mineral.Record 28 no.4, 1-98. Gait,RI (1978) The crystal forms of pyrite. Mineral.Record 9, 219-229. Hyrsl,J (2008) Pseudomorphs from Peru. Mineral.Record 39, 103-109. Hyrsl,J and Rosales,Z (2003) Peruvian minerals: an update. Mineral.Record 34, 241-254. Miyawaki,R, Yokohama,K, Matsubara,S, Furuta,H, Gomi,A and Murakami,R (2010) Huanzalaite, MgWO4, a new mineral species from the Huanzala mine, Peru. Can.Mineral. 48, 105-112. Moore,T (2005) Denver show 2004. Mineral.Record 36, 113-117. Visit the "Rock of the Month" Archives! or the "Rock of the Month Index"!